Nowadays, more and more families are choosing to purchase their own trampoline for use in their own back yard. This is a great development, as trampolining is an excellent way of getting an all-round cardiovascular workout without stepping foot in a gym! More and more parents are recognising that a trampoline is a great way to tempt kids away from the TV and out into the fresh are for some active fun. Furthermore, did we mention that bouncing on a trampoline is simply great fun? You're really never too old to enjoy the freedom and adrenaline rush that comes with jumping on a trampoline. There are lots of different options on the market, and it can be difficult to know which represents the best option for you and your family. There are many points to consider, including the amount of space you have available in you back yard, who will be using your trampoline, and most importantly safety. For those who have been putting some time into researching their trampoline purchase, the Jump Power brand often pops up. They provide a range of trampoline options, but are they the best choice for your home? Luckily, we've been doing our research and have compiled everything you need to know before you buy. 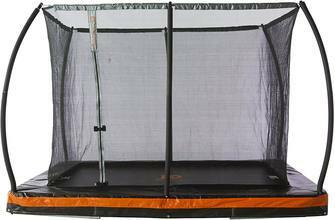 Read on for our Jump Power trampoline review. Are Jump Power trampolines good? How does Jump Power compare to other brands? 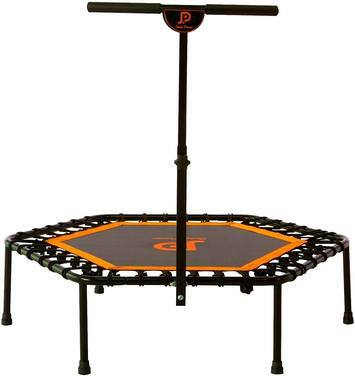 Where do I find a Jump Power trampoline for sale? Bungee cords: Instead of the springs used in many trampolines, this model uses 36 black bungee cords to achieve bounce. Jump Power claim that their bungee cords are more extensively tested than most other brands, to ensure that they are long-lasting and hard wearing. Hexagonal: This shape is said to be easier on the joints than a traditionally-shaped round rebounder. The shape also provides a larger bouncing surface than a circular trampoline. Safety approved: The rebounder has been approved by the Safety Council of America, assuring you that you can bounce safely. Stability handle: This model comes with a built-in stability handle. This is particularly useful for seniors of people who have concerns about their stability when using their rebounder. It allows you to hold on for support, so you don't need to worry about overbalancing and falling during your exercise session. Galvanized steel frame: Galvanized steel is a great material for trampoline frames, as it is highly durable and less likely to rust or bend with extended use. This makes for a product which is longer lasting, for many years of happy bouncing. Safety enclosure: For extra safety, this trampoline has a built-in net enclosure. This stops a mis-bounce propelling you out of the trampoline and injuring yourself or others, and provides good peace of mind when your kids are using it. It has a patented ring-release system at the top, allowing quick removal. The zip fastening at the entrance is a great addition, as it is very secure and prevents children or adults from falling out of the door. Rectangular shape: This allows plenty of bouncing space. It also makes it easier to slot into your existing yard layout than a circular trampoline. 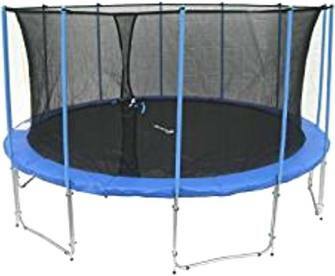 For those seeking a more traditional round trampoline, or that don't want to dig a big hole in their yard, this 14 foot round trampoline may be a more suitable choice. So, is this model a good option for your family? Here are the key features you should be aware of. Galvanized steel frame: Like the in-ground option, galvanized steel provides a durable and long-lasting frame for your trampoline. It's rust resistant, so can withstand wet weather, perfect for back yard use. Center target: The jump mat includes a center target, which is a great safety feature. Why is a center target such a good idea? A target will encourage your kids to bounce in the middle of the trampoline, which makes it much less likely that they will bounce towards the edges. This reduces the likelihood of falls or poorly-controlled bouncing. 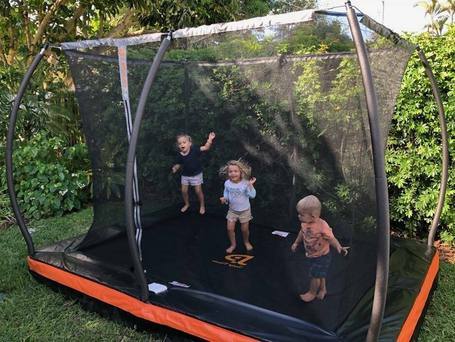 Safety enclosure: The built-in net adds extra peace of mind, as it prevents users from accidentally jumping off the trampoline following a particularly wild bounce. This can prevent nasty falls and injuries. UV resistant: Over time, extended sun exposure can cause wear and perishing of nets and jump mats. Jump Power have applied a special treatment to their enclosure net and jump mat, protecting them from the rays of the sun. This prolongs the life of the product, allowing for many years of happy bouncing. U-shaped legs: The u-shape of the legs is a great addition when it comes to free-standing trampolines. They give extra stability to the trampoline, preventing it from shifting position during use. Of course, this makes for much safer bouncing. Generally, customer reactions to Jump Power outdoor trampolines are positive. Users have commented that the bounce action is very good, and that their kids have had a lot of fun using the outdoor models. Expert reviewers have commented very positively on the overall quality and durability of the trampoline construction, and purchaser reviews concur with this view. Although we could not find many reviews about how easy they were to assemble, those that did comment on this said that it was relatively straightforward if you follow the manufacturer's instructions carefully. Reviews of the fitness rebounder have been more mixed. Customers often comment that using the rebounder has helped them to lose weight, and that is has helped with promoting core strength and all-round improved fitness. Users say that it has lasted well, sometimes over several years of extended use. Also, reviews seem to back up the company's claims that the rebounder is easy on joints and ligaments. Finally, some customers commented on the rubber-ended legs, which they say did a good job of protecting their floors. However, many people who bought the rebounder complained that it practically required a college degree to put together! Difficulty during assembly seems to be a gripe that comes up again and again when reading reviews of the product. Overall, we feel that the quality of these products is very good, making them well worth your consideration, problems with rebounder assembly notwithstanding. If you're considering shelling out on a Jump Power trampoline, you'll want to know how they compare to other brands available on the market. Here, we will compare them to one of the leading brands. When it comes to construction, Skywalker and Jump Power trampolines are broadly similar. Both are made of galvanised steel, are rust-resistant, and have safe and sturdy U-shaped legs. However, for families on a budget, Jump Power trampolines may actually be a more suitable option. At a lower price point, Jump Power models represent a more affordable choice than the more expensive Skywalker brand. The large outdoor models have an upper weight limit of 220 lbs. This means that they will comfortably and safely accommodate the weight of most adults. Interestingly, the smaller fitness rebounder actually has a higher weight limit at 286 lbs. Long-lasting and durable: When you splash out on a big purchase such as a trampoline, you want to be sure that you will get several years of continuous use for your money. The use of galvanized steel gives these trampolines an extended lifetime, so you'll have plenty of bouncy fun ahead of you. It's great that they are UV treating their jump mats and nets, which prolongs their life so you can go longer without replacing. Safety enclosures: Especially when they're being used by kids, you'll want to be reassured that they cannot fall from the trampoline and injure themselves. The safety enclosures on these trampolines means your family are protected from any unpleasant accidents. ​Targeted bouncing: Many modern trampolines do not include a center target, so it's great that Jump Power have included this on some of their products. This adds an extra layer of safety and encourages kids to use the trampoline more responsibly and safely. Focus on fitness: The Jump Power brand has a great focus on the health benefits that trampolining can bring, just like us! Hopefully this will encourage more people to include trampoline exercise as part of their fitness and well-being regime. Great for seniors: We think the design of the fitness rebounder makes it extra suitable for seniors, or people experiencing problems with their stability. Rebounder trainer is a great choice for seniors as it is low-impact and easy on the joints, whilst still providing cardiovascular benefits comparable with more traditional exercise. The stability handle provides great peace of mind for people who are worried that they may overbalance and fall whilst training on their rebounder. While we like the Jump Power products, it's concerning to hear that so many customers had issues putting the fitness rebounder together. We think this product could be greatly improved if they can address some of the issues surrounding assembly to make it more straightforward. Otherwise, Jump Power risks putting people off rebounder training who could really stand to benefit from this amazing form of exercise. We would also love to see a greater range of size options offered by Jump Power. This would allow families with budgets and yards of all sizes to find a product that suits them. Overall, we believe that Jump Power trampolines and fitness rebounders are a good option for families looking for a source of outdoor fun, and for individuals who want an enjoyable and joint-friendly way to improve their fitness levels. These products are certainly high-quality and you can expect them to last for many years. As with all trampolines, ensure that you inspect it regularly to make sure it is in safe working order, especially before allowing your kids to bounce on it. No matter how high-quality the trampoline, things can and do occasionally go wrong. Now you've read our Jump Power trampoline review, you now have all the information at your fingertips to decide if they're a good choice for you, your family and your home. Hopefully, soon you'll be enjoying hours of bouncing fun on your brand new trampoline!